The IITC Accessory Package contains all necessary consumables for replacement in the IITC Life Science mouse and rat tail cuff blood pressure systems. It is supplied according to the users request for the size of cuff liners and O-rings. 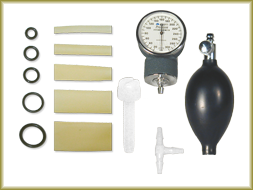 One pressure gauge with small tubing adapters and manual bulb inflator (this can be used for both calibration and inflation when working with relatively small numbers of animals), 24 small nylon hand screws to mount the sensor to the end plate of the IITC animal restrainers, 50 O-rings that hold cuff liners on the cuff, 100 spare cuff liners (cuff liners and O-rings can be mixed), 50 ft. of Tygon tubing for connecting the cuff air ports to your pressure source.